There was a commentary from an author at another blog, Dog Walk Blog, citing that home kitchens are not functional; looking more like living rooms with furniture than places to prepare food. I am not certain if the author, Charlie, is (a) just being cheeky, (b) disagreeable in general, (c) was not part of the process when his kitchen was built, or (d) just irritated that it was his turn to cook breakfast. I’ll assume (d). While I am in agreement with his opinion of HGTV’s over saturation of also ran “me too” shows showing kitchen after kitchen topped with granite counters, I beg to disagree with his commentary that residential kitchens of today are not functional. In fact, a properly designed kitchen, large or small, can be a super efficient hub of the home that would make even the most reticent morning person jump for joy at the prospect of making breakfast. It is all in the planning. In any event, I will respond to his critique on the functionality of residential kitchen design here in my blog. There are volumes of books that discuss the history of the kitchen and it’s relevance to domestic life, so I will not digress into that here. 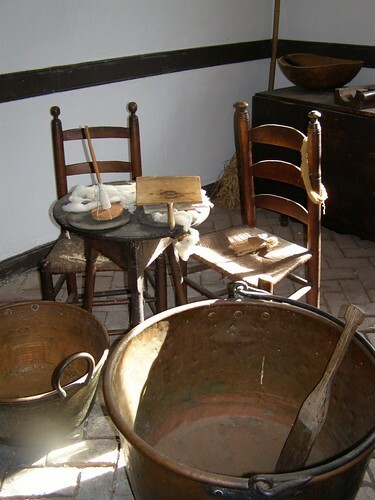 To the left and below are historical pictures from the great food blog, Gherkins & Tomatoes, a wonderful blog that covers topics on Cooks & Cooking throughout history. 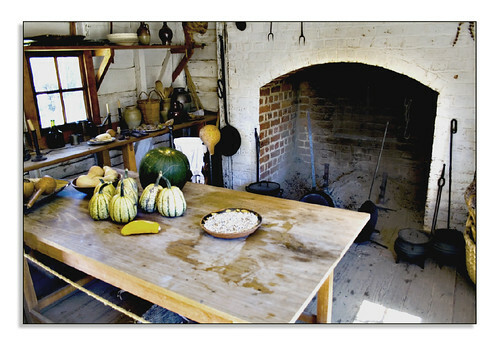 Suffice it to say that in America, kitchens have come full circle from the primitive all purpose “great room” where all family activities took place; and as Americans gained wealth, kitchens were relegated to the back of the house, closed off from the parlor where the family gathered, lived and entertained; up to today’s standards where the kitchen has returned to it’s roots as a “great room” where the family gathers, lives and entertains within the kitchen space and where cabinetry blends into the architecture of the home. Kitchens have evolved as the new living room, but this does not make them any less functional because of the decorative cabinetry. Looking back at the history of the kitchen, it’s easy to see where the trend of kitchens looking more like living rooms started. Creating more comfortable spaces, innovating with useful tools to make kitchen chores easier is the one constant theme throughout our kitchen history. 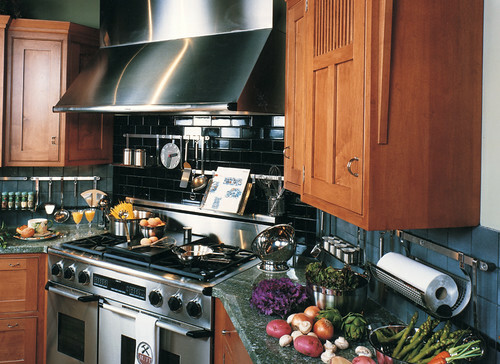 By all accounts stainless steel is a popular material in both residential and commercial kitchens. Hygienic and durable, no one can refute that stainless steel is the practical material of choice for sinks, appliances, ventilation, back splashes and counter surfaces. Gleaming bright and ultra modern, stainless steel counters can be a bold choice but also can be cold and noisy if used as the sole counter surface. I think most people would agree that counter surfaces are personal choices, an area to infuse their own personality into their kitchen. Restaurant kitchens with stainless steel surfaces are noisy because the sound bounces off of all the hard surfaces. Photo on the left French Laundry by Dave Anderson. If you look at counters in this restaurant kitchen on the left and in the video included further down, we can see that even the highly acclaimed French Laundry restaurant in Northern California has a work around solution for stainless counters, covering up most all the stainless steel prep surfaces with gleaming white plastic cutting boards at the line and white butcher paper at the plating area. The use of the plastic cutting boards are practical and butcher paper prevents plates from shifting while plating on the pass and cuts down the noise of plates on the stainless. I would also guess that the butcher paper also prevents the plates from cooling slightly less than if the plates were placed directly on the stainless surface. Would most homeowners be willing to do the same in a residential setting? I think not. Open shelves that predominate in a commercial kitchen can be a drawback in a residential kitchen. While commercial kitchens are typically equipped with heavy duty stainless steel work surfaces with open shelves below and open shelves above, commercial kitchens also employ a staff to keep these surfaces gleaming bright by scrubbing them down daily from top to bottom. While a few open shelves at home require a moderate amount of maintenance to keep the dust and grease at bay, in today’s busy lifestyle, who has the time to maintain all open shelves in a kitchen? Especially near the cooking area. If you have ever run your hand across your vent hood that you missed wiping down in the last week or more, I dare you to test it out and run your hand across the hood, feel the greasy dust on your hand and imagine a layer of that same grease on all your pots, dinner ware and glasses stored on open shelves. Frankly, having open access to all shelves, upper and lower exposed, can look unsightly and cluttered in a residential kitchen. No one is that organized at home unless you are Martha-what’s-her-name. Commercial kitchens maintain a lot of uniformity on the shelves, all white plates, all the same type of cookware, all the same type of utensils. Not so in our kitchens. We “inherit” cookware, have multiple types of dinnerware, mugs, glassware, plastic ware, way too many slogan mugs from business partners and travel mugs and most of us want it covered up from view. Planning and plating by pulling your plate, prep bowls and serve ware out of a cabinet before you make the omelet is key in not getting aggravated in your kitchen. Installing roll out trays in base cabinets, editing out what you don’t need in cabinets or do not use anymore will increase the function of your kitchen. Interior cabinet lighting: Never search for that missing lid or favorite spice again with interior cabinet lighting. Each time you open a door or cabinet drawer, light automatically illuminates the space so you can quickly find what you need. Picture on the left shows lighting switch from Richelieu. Electric Stoves: Oh yes you can regulate heat with induction cooking, powered by electricity of course. Get ready for those perfect pancakes Charlie. 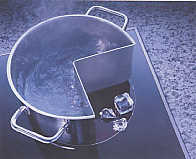 There will always be those who favor gas cooking, but induction cooking, which has been around for several years, should not be overlooked. The following information and more can be researched at The Induction Site, the following is an excerpt. 1. Instant adjustment. 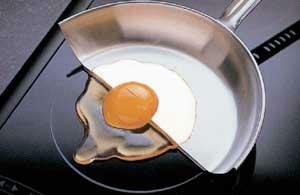 You can adjust the cooking heat instantly and with great precision. This is what sets it apart from the typical electric coil which slowly starts to increase or decrease when adjusted. I can’t argue with this. Unless you have lots of help in the kitchen as show in this photo on the left, from another new favorite blog, (Taste with the Eyes), placing an oven in a tall cabinet that makes it easy to reach and pull out hot food is ergonomically the best way to go. For others with very small kitchens, the sacrifice of eliminating a counter surface is not worth the trade off. For aging in place design, including a wall oven should be considered as a space planning priority. There are ovens with double doors that swing out but they tend to be on the pricey side. Again, another trade off that has to be weighed against the over all budget. Pots and pans should be accessible in roll out trays or drawers. I prefer drawers so that everything is within view with a single pull of the drawer. Hanging Pots and Pans above from a pot rack means one of three things: (a) you can afford hired help to keep them all your pots and pans sparkling clean, (b) You ignore the dust and cob webs and only clean them before the holidays, (c) you don’t cook and your pots and pans are hung from a pot rack just for show. Enough said. Utensils and Knife Storage: definitely agree with Charlie on this point. Utensil storage should be visible and within arms reach in your cooking and prep area. Maintaining cleanliness for utensils kept out in the open is an easier task than maintaining dinnerware and pots and pans on an open shelf. One of my favorite lines is RÖSLE. The Open Kitchen is a genuine RÖSLE concept, lifting beautifully designed professional kitchen utensils from invisibility in back drawers and setting them out for both show and utility. The expandable system incorporates adaptable modules offering infinite possibilities for modifying and enhancing the work ambient as convenient. Your point is well taken. In the best of all worlds, it would be a bonus if all residential kitchens were big enough like it’s commercial counterparts to house both a sink in the clean up zone for washing dishes and another sink to prep our food and wash our veggies. This is a matter of budget, remodeling logistics and size permitting. I think there is no better time in kitchen design, where kitchens can be stylish and very functional. Any chef will tell you that the last thing they want to see after a long day in the kitchen is a utilitarian commercial kitchen at home. Everybody wants to warm it up and personalize it when it comes to their own kitchen. Here is an interesting story. No one is immune from danger in the kitchen, not even firefighters. Fire fighters learn lesson of leaving food unattended on a hot stove.